Enjoy luxury apartment living, superior service and the best location in Fairfax Virginia at Camden Fairfax Corner apartments. Our pet-friendly studio, one, two, and three bedroom apartments, lofts and townhomes are perfectly located in the upscale Fairfax Corner Shopping Center. With direct access to I-66 and Highway 50 and only minutes from the Vienna Metro station – you can easily navigate to the area’s top destinations. Enjoy being a pedestrian with fine and casual dining, shopping, Rave Fairfax Corner 14 Theater and Peet’s Coffee & Tea – all within walking distance. We’re also just a few steps away from CorePower Yoga, Studio BE Pilates, Potomac River Running, The Red Door Salon & Spa and an array of medical offices including My Eye Dr. – Camden Fairfax Corner defines connected living! Residents receive a Verizon FiOS technology package included with a savings off retail pricing. This money-saving package includes digital cable with over 280+ digital channels plus 80 HD channels, high-speed Internet and WiFi. In addition to the shopping, dining and entertainment right outside your doorstep, our Fairfax apartments offer a multitude of amenities within the community. Some of the amenities include a state of the art fitness center with free weights, cardio equipment and TRX training zone, two resort-style swimming pools with WiFi and sun deck, outdoor dining areas with grilling stations and an executive business center and private conference room. Additional amenities include 24-hour emergency maintenance, car care and maintenance center and door-to-door trash and recycling pick up. We also have your convenience in mind with a controlled access building, covered parking garage and additional storage available in varying sizes. Camden Fairfax Corner is also currently in process of becoming a completely non-smoking community. Located in prestigious Fairfax, Virginia, you'll find whatever you need just around the corner including Fair Oaks Mall and the bevy of options Fair Lakes offers at East Market, Fair Lakes Center and the Shops at Fair Lakes. With all of this at your fingertips why would you want to live anywhere else? 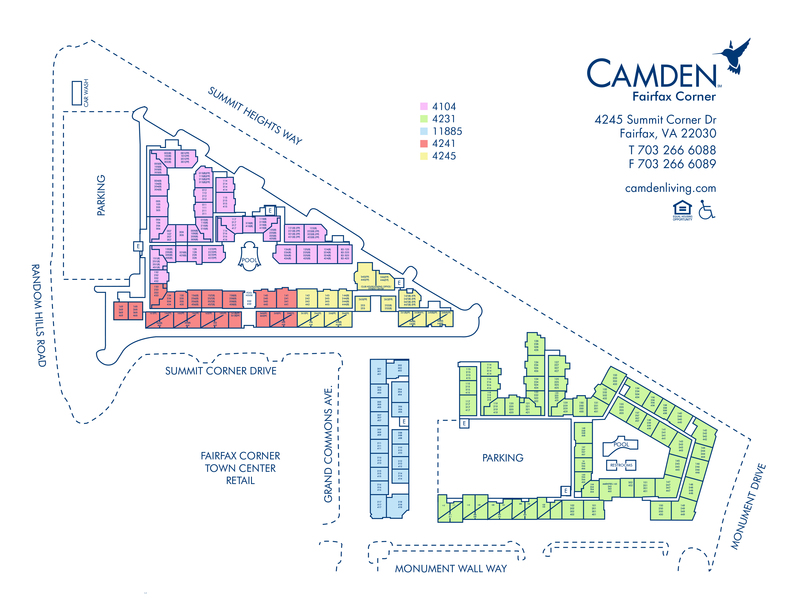 Your new apartment is waiting for you at Camden Fairfax Corner! Get the perfect spot! Each apartment home is given a parking permit - additional permits are $45 per month. Garage parking is on a first-come, first-served basis. We also offer residents reserved covered and uncovered parking for $50 per month. Residents can print a 48 hour guest permit for visitors. Open parking is available for visitors with a 48-hour Guest Permit at designated open parking areas.